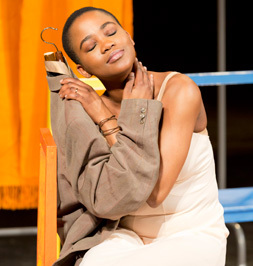 Peter Brook and Marie-Hélène Estienne co-direct Can Themba's hauntingly beautiful story The Suit, with music by Franck Krwczyk. Performed by a company of international actors, singers and musicians this run at the Young Vic follows its critically acclaimed world premiere at the Théâtre des Bouffes du Nord in Paris. In the dusty heat of 1950s Sophiatown, a young worker returns home to find his wife in bed with her lover. The lover escapes, leaving behind his suit. The only revenge the husband takes is to instruct his wife to treat the suit as an honoured guest. But how long can she endure this pitiless sentence? This new production is part of World Stages London - an unprecedented collaboration between eight London producing venues and 12 UK and international co-producers that celebrates the exhilarating cosmopolitan diversity of London.